which many use. 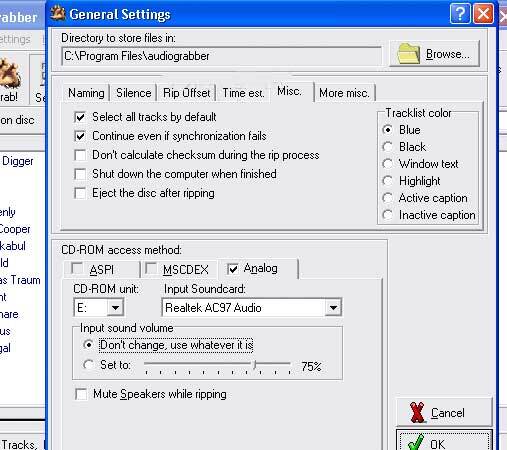 These include but area not limited to normalizing the volume on the file which can be very useful when you don’t have a good audio file. If you are going to edit an audio file then you can also delete the silence from the beginning as well as at the end of the audio tracks which makes for a smaller file as well. You can also use the software to export the files to an external MP3 encoder and these could be a variety of programs such as Fraunhofers L3enc or other MP3 and WMA encoders which are on the market. Much like LameFE you can also get all the information of the music from FreeDB which is an online free database of music titles. The software is portable and you should be able to run this off from a USB drive without the need for a USB driver. When you are finished using it then you can simply delete the software as it does not install on your computer. The software will look at your soundcard and your CD drive and draw the audio from there. You can also mute the speakers while this is done as it can be a bit annoying of you have to listen to the same music all the time or if you are busying doing something else. Most times the CD access for ripping a CD would be via analog. Note that it will also be able to tell you how long the CD rip is going to take as LAME does this and reports it to the software. Once it is done it can also eject the CD when done. There are a number of programs which do this so search this website for other GUI interfaces for Lame as well. You can download the software below.